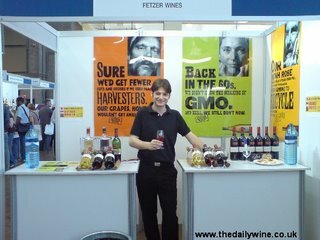 THE TESCO Clubcard Clinkers poured into the municipal-styled concrete dome of the Royal Horticultural Halls this weekend, where I was positioned behind Fetzer's stand. The answer soon became apparent as the front doors were peeled back - everyone. Tesco seems to appeal to young and (sometimes very) old; city-slickers, bohemians, the deaf and the blind, partially mobile, black, white and all the patina in between. Even former newscaster Michael Buerk did a few laps with guests. Self-proclaimed maverick Malcolm Gluck also freely ran around in swimming-style shorts, as he did inappropriately at Liberty's (post) earlier in the week. 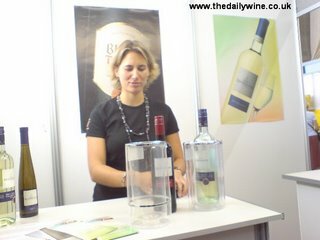 Opposite my stall, Christine, newly appointed winemaker of Kendermans, a new wave producer of mainly light white Germanic wines (including Black Tower) introduced me to her latest vinous offering, a Pinot Grigio Chardonnay which was the definition of pleasant, but very refreshing nontheless, and not flawing in ABV proof. 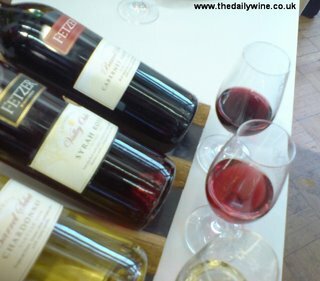 I was impressed, but not yet in awe of Tim Adams' '01 The Aberfeldy Shiraz [£24.99] which gives more for your money, including a splintered log cabinful of cedar. Over time this will become, I think, quite sublime, however. For now, Yalumba's The Octavius is much more of a lithe gazelle.